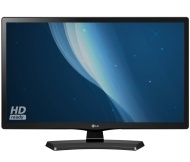 alaTest has collected and analyzed 163 reviews of LG 24MT48D. The average rating for this product is 4.7/5, compared to an average rating of 4.3/5 for other products in the same category for all reviews. We analyzed user and expert ratings, product age and more factors. Compared to other products in the same category the LG 24MT48D is awarded an overall alaScore™ of 89/100 = Very good quality. This product is just what we wanted. this t.v. is just what we were looking for. the salesman was very helpful. Great picture and intuitive to use. Bought this for occasional use for grandchildren and for playing on the wifi. Did not expect it to be as good as it is for the price, add to that the usual excellent service from the staff at Bournemouth you couldn't ask for more. We just wanted a TV for the bedroom. The picture quality is excellent and the controls logical and easy to apply. the lg 24mt48df tv is actually a very good tv for the price .picture quality is excellent.